Here we are once again my friends. A new edition, a new Eldar codex, and another review of it. This will be coming out in parts, not necessarily because it’s a review that takes that long to digest, but because I’m writing it in parts and I want to get it out as fast as possible. First up, as always, is the fluff and aesthetics of the book – in my mind a critical part of the Codex experience, and the way most people choose their armies. First, a disclaimer. I’m not reviewing a physical copy of the book, but rather the “Enhanced Edition” available on iBooks. Why? Because despite ordering the physical edition, I don’t have it yet, and won’t have it for awhile. Because I was one of the people who decided, in pursuit of free shipping and neat models, to complete some of my collection with the special single-run, formerly OOP Eldar models of yore, including a Spirit Singer, some alternate Farseers, and a kneeling Ranger because who doesn’t think their snipers should hunker down a bit more? This was a mistake. The official shipping date for those is “someday”, which means my cards and codex are stuck as well. I also preordered the electronic copy because I like having both for different purposes, which is fortunately why this review isn’t dead in the water. There isn’t honestly much to say about this – the book isn’t revolutionary by any means, but has the usual feeling of rich, saturated gem tones and great artwork. There’s a few new art pieces, including a pretty spectacular battle with Magnus and Company as well as some more classic pieces – the latter predominate, presumably because of the extremely tight timelines these books are being written under. The book lays out the structure of a warhost in far greater detail than I recall in previous books, with a clear command structure, dedicated sub-units, etc. – though it then notes that many Craftworlds approach things slightly differently. But it’s interesting to see the formalization of what exactly the Eldar look like when they go to war, structurally. Otherwise, it’s pretty standard, though I will note the “Points in the Back” thing is especially infuriating in a digital copy of the book if you’re making a list. If there was ever a call for another one of those little hyperlink pop-ups, it’s to bring up the points cost on the unit’s entry sheet. Because as much as I would like the world to chill out and fully embrace power levels, that’s not in the cards, and anything that eases the burden of creating a points based list is appreciated. Click the unit entry in the top left. It’s a marvelous age we live in friends. This is what I’m really excited about, because as anyone who reads this blog knows, the 8th Edition fluff has…not exactly resonated with me. And one of my complaints is that, because the setting has advanced and there are now “new” things – the demon Primarchs, Guilleman, the Primaris Marines, the Ynnari etc., if you want to play with those things, you’re confined to a fairly narrow slice of the 40K setting – namely the 200 years between the start of the Indomintus Crusade and “now”. In 40K terms, that’s almost nothing. And so far, what’s been happening in that almost nothing has been exclusively focused on the Imperium and their traitor Legion foes. Lots about Cawl’s Miraculous Wonder Workshop and various Primarchs coming out of the woodwork to settle old scores, but very little about the rest of the galaxy. Which was a little frustrating, because while she was busy waking up Guilleman and turning the entire Imperium into an Eldar puppet regime saving the galaxy, Yvraine also started waking up a god that might be able to kill She Who Thirsts. Thats kind of a big deal, and then…nothing. Well, there’s still nothing about her, because Your Cross Faction Princess is In Another Codex. Not unexpected, to be fair. But we do get to find out what all the proper Eldar have been up to all this time. Biel-Tan is apparently genuinely at half-strength between the dead and those who went and joined the black parade, but that hasn’t stopped them from killing the lesser races for daring to build a colony on a planet they called dibs on back when their opponents were single-celled organisms. Ulthwe is up to their usual shenanigans, but it’s expressly touched on what Eldrad is doing – essentially he’s being a nomadic quasi-Corsair with his renegade faction, which is awesome and opens up all sorts of opportunities for using him. And there’s allusions to three way Just As Planned battles between Proper Ulthwe, Eldrad’s Renegades and Ynarri-sympathetic Ulthwe, because a three way Craftworld Civil War is exactly what the Eldar would do. Iyanden is unsurprisingly down with this whole God of the Dead thing. Saim-Hann is apparently being pulled in a ton of different directions by different groups requesting their help and are showing up everywhere, which is, again, an awesome amount of room to write your own Wild Rider antics and justify just about any campaign presence. Alaitoc is apparently in high demand for their ability to navigate the Webway, and while everyone else is freaking out about the Cicatrix Maledictum cutting off big chunks of the galaxy, the Craftworld full of exiles and rangers just kinda shrugs. Some of the minor Craftworlds are touched on as well – Il-Kaithe, Lugganath, Altansar, Yme-loc, Iybraesil and Mymeara all getting write ups. There’s also room for introducing new elements in – the suggestion that all Craftworlds have been hit by the forces of Chaos meaning anyone who was super-good at hiding can now be written into the fluff. There’s a keyworld: <Aeldari> battle featuring literally everyone to put down another attack on poor Iyanden. Biel-Tan puts down a three-planet daemon invasion and puts a hive world of cultists to the sword, because even depleted they mean business. There’s tales of saving some confused Imperials, starting a three way war between the Imperium, Nurgle and Necrons, and presumably then scampering away giggling hysterically. Ulthwe shows up helping literally anyone who could be classified as “The Good Guys”. Because That’s How Eldar Do. Overall? Nothing amazing, which isn’t surprising given the breakneck pace of the codex releases, especially given the Ynnari’s current possession of the plot-ball and the lack of new models that need fluff for them. 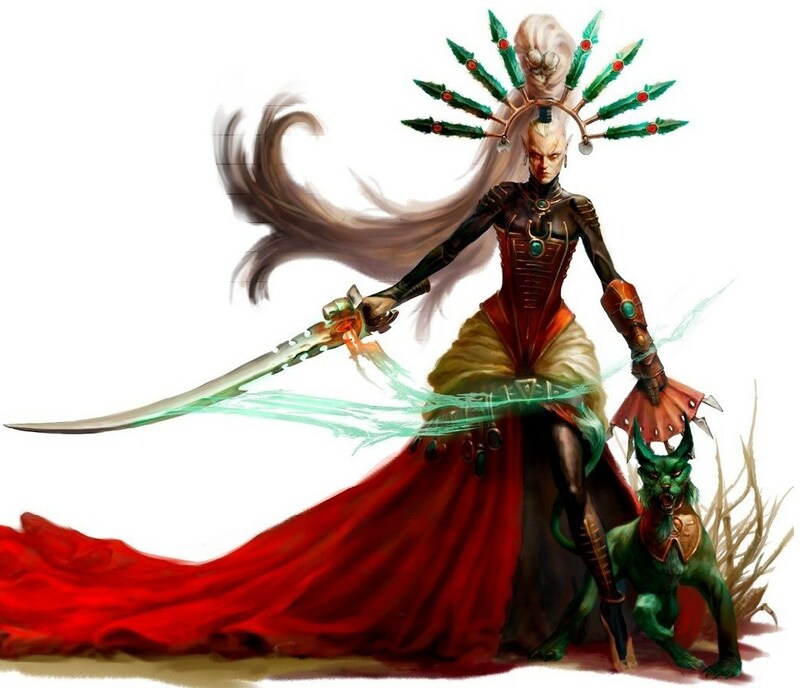 But a welcome bit of room for Eldar shenanigans in the new age – and all of it in the characteristic style of being swift, capricious, and overly complex. An an excuse to have Eldrad showing up everywhere, whether your space elves are painted black or not. The enhanced edition datacard points link is the unit type icon at the top left, I believe. They do! Will edit shortly, but in the meantime, thanks.